For more information please call 513-759-4256. 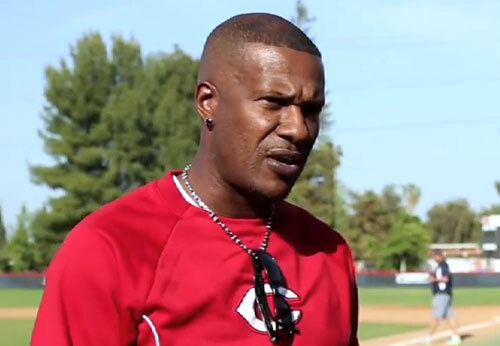 Eric Davis is a former MLB outfielder who played for the Cincinnati Reds from 1984–1991, the Los Angeles Dodgers from 1992–1993, the Detroit Tigers from 1993–1994, the Cincinnati Reds again in 1996, the Baltimore Orioles from 1997–1998, the St. Louis Cardinals from 1999–2000 and the San Francisco Giants in 2001. Davis is a two-time All-Star for 1987 and 1989 plus he is a World Series champion for 1990. Davis is a three-time Gold Glove Award winner for 1987, 1988 and 1989 plus he is a two-time Silver Slugger Award winner for 1987 and 1989 as well as the Roberto Clemente Award winner for 1997. Davis was inducted into the Cincinnati Reds Hall of Fame in 2005. PFP Sports Talent Agency is a top booking agent for motivational sports speakers and sports personalities. If you would like to book MLB stars like Eric Davis for a speaking engagement, personal appearance or special event, you can request Eric Davis agent and speaker information from PFP Sports Talent Agency or call 800.966.1380.